"Chuck Willis has been nothing short of a huge sigh of relief in our search for an educated, patient and talented barefoot farrier for our young gelding. After running the gamut through farriers which were overpriced, rushed, rigid and unnecessarily stern with our horse, we found Chuck. He was and is kind, gentle, intuitive, laid back, and his knowledge of his craft far exceeded our greatest expectations. It is individuals like him that lessen the stress of horse ownership and create the peace of mind that adds to the joy of spending happy, healthy, quality time with our horse. If you are on the fence between keeping your horse barefoot or shod, Chuck Willis is the man to walk you through the transition and show you with results why barefoot hoof care is the answer you’ve been searching for and so much more!" In 2006 when my Percheron was only 3 years old she came up seriously lame. I took her for Xrays of her front legs and hooves that were sent to WSU and it was determined that Sydney had Pediosteitis (which is deteriation of the coffin bone). Also, she had extreme Sidebone, Laminitis and a crack that went from her pasturn down into the coffin bone. The Veterinarian told me to be prepared that in possibly six months to a year I would have to put Sydney down. I cried for 3 weeks. Meanwhile I was instructed to have Heart Bar shoes and pad put on her front hooves. This helped briefly relieve her pain, but then Sydney managed to get one shoe off and so I had the other removed. I found some Boa Boots that seemed to be a substitute and made her more comfortable. Also, I made sure that she didn't get any "hot" feeds and strictly grass hay. She improved somewhat, so I took decided to hitch her to her cart and go with a group out on a drive. With the boots she did okay and after relating the lameness story to a couple ladies that were retired Veterinarians, they asked to examine Sydney's hooves and told me about a farrier that came from the valley to do Natural Hoof Trims. So I booked a trim for Sydney with Chuck Willis. 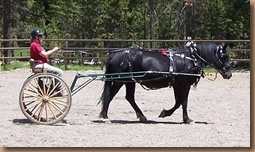 After about 4 trims I really could see a huge difference in Sydney's movement, she was once again rearing, bucking and playing with the other horses as well as could go several hours pulling the cart without any apparent pain. I was sold because the Barefoot trims saved her live and this meant everything to me because I had raised Sydney from a foal. Now Sydney is going on 6 and doing super even without boots. Recently, I took her on a drive over rocky terrain and she hadn't any problems or pain. My other horse ShyLow, an 11 yr old Palomino Qtr horse had pasterns that angled back quite a bit and with 3 years of trims she is standing noticably straighter. You can not tell me that the Natural Hoof Trim doesn't work, because I have two horses that have improved considerably. I can't thank Chuck enough for giving me back Sydney and helping ShyLow have a straighter stance. My previous farrier was great, did what I asked for our horse with navicular (per the veterinarian), a big grey gelding named Zip. Zip never did improve since his diagnosis in 2002. 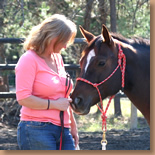 May 2007, I went to a Natural Hoof Care Clinic, volunteered Zip as a demo, and wow! What a difference in how the hoof looked. The real test was in how he would adapt to this new trim. He was a little sore the next few days but didn't display the head bobbing and stiffness I would normally see. I decided to continue the natural trim to see how he would do. We searched for a natural hoof care trimmer and located Chuck. He lives 4 hours from here, but was doing occasional work in Central Oregon, we decide to have him come out. He trimmed my horses, including Zip. He also encouraged me to try a set of boots on him. At this point, after Chuck trimmed him, (natural trim #2) I drove him in a circle and did not see ANY signs of lameness. I turned him out into the pasture, and a few hours later saw him RUNNING with the other horses. I had never seen this horse run in the 6 years I had owned him. I was sold! I am very happy with Chuck's work and his willingness to share his knowledge. I enjoy his company and the horses really seem to like him. Chuck is consistent and always on time. If he's going to run a little late, he will call. He or his wife always contact us the week before to make sure we know when our appointments are. Chuck has a gentle spirit, and every once in a while I might catch him hugging one of the horses. I would trust him with my horses even if I weren't present. I am especially happy with how Zip is doing, he is 25 years old now. And to think all this time all he needed was a natural trim to help him heal. I am convinced his feet are much healthier and that the blood is circulating in his body the way it is meant to.